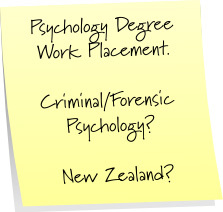 I am currently studying a BSC Hons Degree in Psychology and I am hoping to specialise in Criminal/Forensic Psychology. Year three of my course consists of a work placement and I am very interested in doing this in Wellington - New Zealand. Does anybody know if this would be possible, and if so who I would need to contact to arrange this?